Hello and happy Tuesday. It's time for another challenge at CASology. 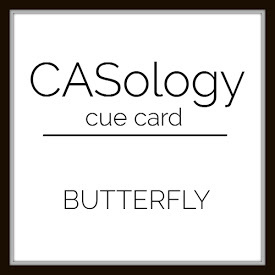 This week, our cue word is BUTTERFLY. 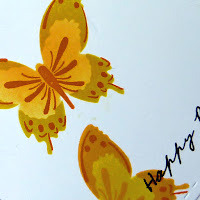 I have so many butterfly stamps and dies, it was a challenge to decide which to use. In the end, I picked a set I hadn't used very much--PTI Make it Market Color Pop Butterflies. Try saying that 3 times fast! I followed a very common design, with three vertical elements, some going off the page, and with the sentiment partly overlapping my image. Now it's your turn. How does inspire you? I hope you play along this week. Please remember to keep it Clean and Simple. This is lovely, Joyce. Beautiful crisp stamping and great design. Thanks for choosing my card as an HM for the SWOON challenge. I appreciate you kind words and encouragement. Beautiful card. Love the colour and design. Beautiful! I love all the layers of color! What a lovely and sunny CAS card Joyce! Beautiful butterflies Joyce, love that colours you chose! The butterflies look wonderful in those colors, Joyce. Beautiful, love the happy colors! 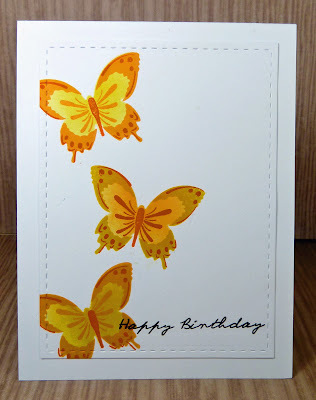 Such a great choice of butterflies and I love how you used the rule of 3's on your design! Gorgeous card, Joyce!